Did you know that Galvotec Aluminum Anodes protect the first platform project completed by Shell's Deepwater Services Group? Shell Exploration & Production Company has begun oil and gas production from its 100 percent-owned Brutus tension leg platform (TLP) located in Green Canyon Block 158 in 2,985 feet of water in the Gulf of Mexico. Brutus, an eight-slot TLP, is Shell's first deepwater platform to be specifically designed to serve as a hub for future subsea developments in the surrounding area, although several Shell platforms have been previously retrofitted to serve as hubs. Brutus is Shell's fifth TLP in the Gulf of Mexico. The Brutus project is also the first major platform project completed by Shell's deepwater services group. The services group was established in 1999 to better leverage Shell's global expertise to reduce cycle time and costs in the construction of major deepwater projects around the world. "With the completion of Brutus, we have proven that the concept surrounding the development of an internal center of excellence in deepwater project execution is a valid one," commented Matthias Bichsel, director, Deepwater Services, Shell International Exploration and Production Inc. "Working seamlessly with the SEPCo staff, we developed and executed a plan that completed the Brutus project seven months earlier than the previous best completion time and 18 percent below our cost benchmark, which was the Ram Powell project. This type of excellent performance is already being shared with Shell operating units globally." Shell's Deepwater Services was responsible for design, construction and installation of the TLP system and pipelines, while SEPCo is responsible for subsurface evaluation and management, drilling, completion and production operations. Although viable as a stand-alone project, the Brutus field will not be theonly oil and gas development utilizing the platform for processing. "Designing the Brutus platform to accommodate future production from surrounding areas continues Shell's successful strategy of establishing and leveraging significant infrastructure points in the deepwater Gulf of Mexico," said Raoul Restucci, president and CEO of Shell Exploration & Production Company. "Having a strong infrastructure creates an economic and competitive advantage and minimizes the environmental footprint of future operations. "I am extremely pleased with the Brutus project," continued Restucci. "It is an outstanding example of delivering on our promises. We are proud of the accomplishments of the project and operations staff in delivering the project to production in record time with excellent cost performance." Production began on Aug. 3, 2001, and is continuing to ramp up. The average daily production rate currently is about 25,000 barrels of oil and 35 million cubic feet of gas from the first well. A peak daily production rate of 100,000 barrels of oil and 150 million cubic feet of gas from the Brutus field is anticipated to occur by the second quarter 2002. Gross ultimate recovery is estimated at about 250 million barrels of oil equivalent. 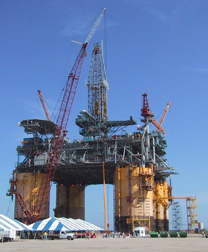 The Brutus tension leg platform is located approximately 165 miles southwest of New Orleans. The TLP is 3,250 feet high, from the seafloor to the crown block of the drilling rig. Although similar in size and configuration to Shell's Mars and Ram Powell TLPs, Brutus was designed with increased displacement to handle subsea tiebacks and with dual processing systems for its role as a hub.